For the background I ran Brocade Blue cardstock through my Cuttlebug using the Fiskars snowflake texture plate and notched the corners with the ticket corner punch. 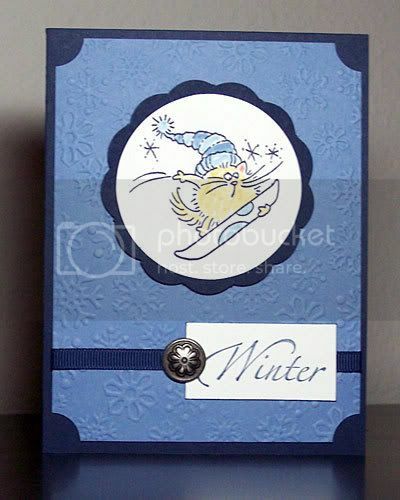 I stamped "Winter" on a scrap of white, and scraped the edges on the Night of Navy pad to define the edges. I glued a piece of navy grosgrain around the background piece and attached the Winter piece with glue dots and added a special brad. I attached the Fluffles focal image using pop dots for dimension. I used Sticky Strip to attach the whole thing to a Night of Navy card base because the embossed background needed extra hold. And thats about it. Oh by the way, I made twelve of these...WHEW!